Martha Stewart has a great printable lunch calendar on her site that might make getting back in the swing of a school schedule a little easier. 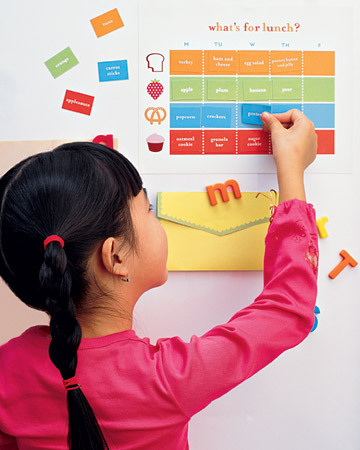 Print out the lunch chart (Martha recommends making it magnetic) and then write their food choices on these labels. Let them build their weekly lunch menu themselves and then you (or they) can pack their lunch from the kid and mom approved menu.